Gold is initially formed by extreme heat and pressure which forces the molten gold to the surface. These cataclysmic events are most frequently caused by collision of the earth’s tectonic plates which produces earthquakes and volcanic eruptions. This is why gold veins usually are found in mountainous regions – the same forces that created the mountains also bring gold to the surface. Although it all starts from the same place, once gold reaches the surface, things can vary greatly. Coarse gold is a type of gold which has not been exposed to the elements but has remained in the vein where it originally emerged from the earth’s crust. This is much less common than placer gold, which has been moved from the location where it first reached the earth’s surface. Exposed gold veins on the surface erode and release their gold into placer deposits which are then moved along further by the elements. Because gold is such a soft metal, it is easily shaped by weather, glaciers, water and other corrosive forces. Very quickly, in terms of geologic time, it is worn down to small, often smooth pieces. Most placer gold is found in either the occasional nugget, small pebbles, sand, flakes or dust. Although always much rougher in texture than placer gold, very little coarse gold is crystalline. 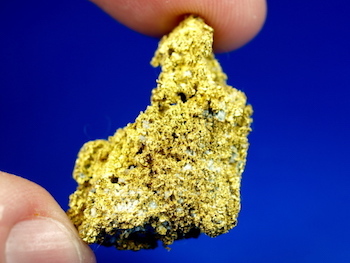 Rough gold is often less collectable than the more commonly found placer nuggets, as it is may be stained with iron or other substances. This is then usually crushed and processed to remove the gold content and then often melted into ingots. Crystalline gold itself is much rarer than other types of coarse or “natural” gold because it can only form under very particular circumstances. The gold crystals can only grow in the very unusual locations where they are not hindered by a lack of space, such as large cavities or other voids within rock formations. In addition to space, all large crystal growth requires stable conditions that support slow growth—at least growth slow enough to lead to the formation of a few large crystals rather than millions of tiny ones. Rapidly growing crystals tend to be extremely small, sometimes even microscopic. These crystals may be beautiful, but if they cannot be seen, who really cares? The void where the crystalline gold is growing must remain empty of other minerals to provide room or the growth will stop. Of course, the voids will not remain empty forever, as they will eventually be filled with other material, most frequently quartz or other minerals. However, the quartz or other rocks which stopped the growth of gold crystals are not all bad, as it will then become their protector, shielding them from the elements. Sometimes crystalline gold is completely covered by quartz. 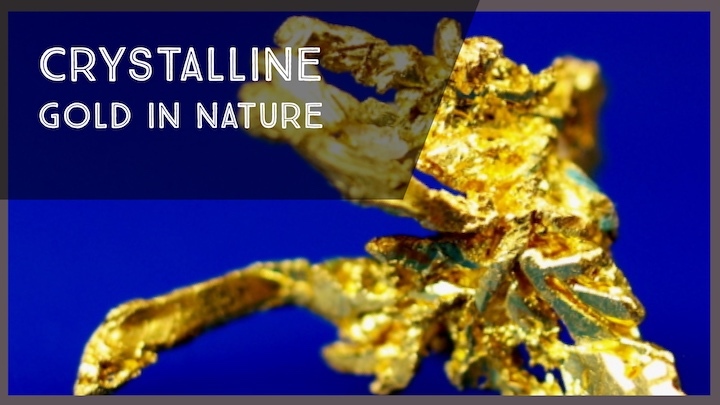 Because of its extreme rarity, extraordinary shapes and brilliant color, crystalline gold is often far more valuable than all other types of the metal. Some of these unusual shapes are more often found in gem crystals rather than gold. Crystalline gold can form cubes, dendrite or dendritic patterns, octahedrons, thin leaf and sheet forms and many other surprising designs. The prices for different crystalline gold specimens can vary greatly. The major determinant of its value is its appearance, not the amount of actual gold in the piece. The most brightly colored and unusually shaped pieces are much more highly prized. Just like a high-grade gemstone; it isn’t just about size, but mostly quality. Essentially, crystalline gold samples are worth whatever a collector is willing to pay for them. For the most exquisite examples, that price can be very high. Some exceptional specimens will sell for ten to twenty times their melt value, but such pieces are very rare. 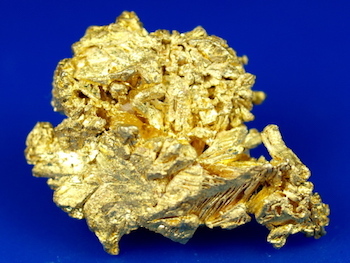 Nice gold crystals can typically sell for several hundred dollars per gram.